In a big bungalow in Andheri, a small entrance opens out to Bliss, an eclectic store selling all things you’ll love. Locals of Andheri have been lovin’ this gem for a while, and we wonder why we were not privy to it before. To explain in shorter terms, Bliss has everything – from cute earrings that you would put on, flamingo pins you would add to your denims to large wall hangings, cute chevron cushions for our home and even clothes we’d love. It’s a multi-designer store and keeps many, many awesome brands in co-existence under its roof. From magnets from Doodle-do to dresses from Quirkbox and Crow, shoes by Vraj:bhoomi and assorted stationery items, this store has it all! 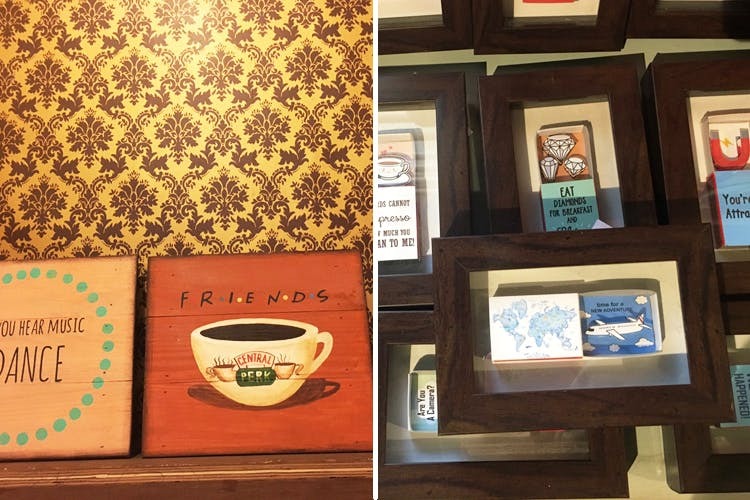 We were immediately drawn to their quirky pieces for our wall, especially the F.R.I.E.N.D.S’ Central Perk wooden hanging and even, one openly declaring its love for Nutella. These wall hangings are priced between INR 1,500-2,500. There’s only so much we can say to describe the store, except this – there is really something for everyone here. Just go simply for a good time and to browse through the fun products in this two-storey store. If you’re simply too far from the area, hit up their newly launched online store!